A court verdict over deadly soccer violence sparks fresh unrest in Egypt, with two people killed. A court verdict over deadly soccer violence sparked fresh unrest in Egypt on Saturday, with two people killed and buildings torched in Cairo, AFP reports. A Port Said court, sitting in Cairo for security reasons, confirmed death sentences for 21 defendants and handed down life sentences to five people, with 19 receiving lesser jail terms and another 28 exonerated. Fans of Al-Ahly club, whose members were killed in a February 2012 stadium riot in Port Said in which 74 people died, had warned police they would retaliate if the defendants were exonerated. AFP reported that one protester was brought to a mosque in Cairo's central Tahrir Square with gunshot wounds, and medics confirmed he was dead. Earlier, emergency services chief Mohammed Sultan said a protester suffocated after inhaling tear gas, and "died in the ambulance on his way to hospital." Police fired tear gas and bird shot as the clashes intensified on a large avenue on the banks of the Nile. Angry crowds hurled rocks at the police and threw a petrol bomb at a luxury five star hotel in the area that houses several embassies, the report said. Protesters also set ablaze two restaurants near Tahrir Square saying they were owned by Islamist businessmen, witnesses said. Sporadic clashes have been going on for weeks. The numbers swelled on Saturday when the regular protesters were joined by activists and soccer fans following the verdict. Protesters also blocked railway tracks between Cairo and the Mediterranean city of Alexandria, forcing authorities to suspend trains between the two cities, state news agency MENA reported. 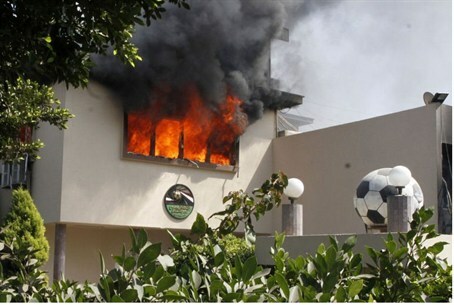 Huge flames rose above the main building of the Egyptian Football Association and a police officers' club in an affluent neighborhood on an island in the Nile. The trial has been a ticking time bomb for President Mohammed Morsi, who is facing a revolt in Port Said, growing nationwide unrest and an unprecedented police strike. The court handed 15-year sentences to the former head of police security, General Essam Samak, and to Brigadier General Mohammed Saad, who was responsible for the stadium gates, which were locked when the riot broke out. During sentencing, the judge read out a string of names without explaining who they were, leading to much confusion. "First we were happy when we heard the 21 death sentences. We were cheering and didn't hear the rest of the verdict," one supporter told AFP. "Then we were very angry." Any verdict in the highly charged trial was likely to trigger angry reactions. In Port Said, hundreds of people prevented ferries from shuttling residents between the banks of the Suez Canal, in protest at the confirmation of the 21 death sentences. They set fire to tires and put up a huge banner at the entrance of the port demanding "independence for Port Said." The Suez Canal Authority, which runs the vital waterway for global commerce, said the canal had been unaffected by the unrest. Hundreds of grim protesters also marched on the Suez Canal and a port in the city as military helicopters flew overhead and troops stationed tanks outside the port. In February 2012, clashes in Port Said between fans of home side Al-Masry and Cairo's Al-Ahly left 74 people dead and sparked days of violent protests in the capital, in which another 16 people were killed. Tension has been running particularly high in an already divided Egypt since January 26, when the court first issued the death sentences in the country's deadliest-ever soccer disaster. In Port Said, the government has almost completely lost its grip on security, reported AFP. Police on Friday withdrew from their headquarters and handed responsibility for securing it to the military, deployed in the city since late January. Threats of further unrest have cast uncertainty over government plans to introduce economic reforms that are key to obtaining a crucial $4.8-billion dollar International Monetary Fund loan.